With our 2 Waterjet Cutting machines with table sizes up to 6' x 12', we can cut almost any material up to 8’’ thickness, using 65,000 psi and only water and garnet resulting in a smooth edge and exact results up to 0.005’’ accuracy. 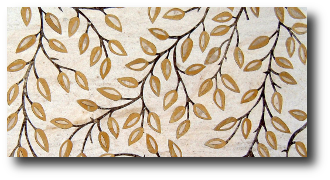 We are a leading company that does Marble and Stone inlays. 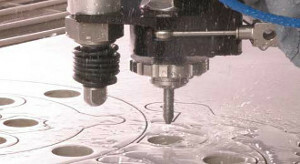 Through our precision waterjet cutting we can fabricate any design in any size. Our experience in design and prop fabrication allows us to fabricate almost anything that you can dream up. 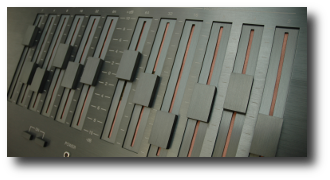 We have years of knowledge and experiance in multiple areas of art/studio design. 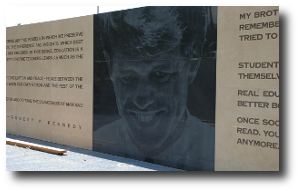 The Robert F. Kennedy Community Schools is a K-12 complex located on the former site of the Ambassador Hotel in Los Angeles, California where U.S. Senator Kennedy was assassinated in 1968. Welcome to Charisma Design Studio, Inc.
With our 2 Waterjet Cutting machines with table sizes up to 6' x 12', we can cut almost any material up to 8" thickness, using 65,000 psi and only water and garnet resulting in a smooth edge and exact results up to 0.005" accuracy. From simple projects to artistic creations, we will work with you to bring your sketches to reality, combining experience and technology to get the job done on time and within budget. Since 1980 we have perfected our techniques of etching and carving glass to create unique custom pieces. From simple frosted designs and borders to deep carved works of art. Techniques can also be applied to metal, stone, plastics, concrete and wood. We are a leading fabrication shop for major movie, television, and entertainment studios. With same day turnarounds possible, we can help create complete projects or parts for yours. At Charisma Design, we have fabricated arks, complete bimahs, menorahs, eternal lights, mezuzahs and other Judaica, both as complete design and fabrication and fabrication for other artists. We also have fabricated for churches and other religious institutions. As third generation sign fabricators, we specialize in creating high end signage using metal, glass, wood, plastics, stone and other materials to make custom, one of a kind signs. Using our waterjet technology, we accurately cut different colored stone and other materials to create one of a kind inlaid medallions, tables, and sculptures, from coasters to large hotel lobbies. Whether you need a donor wall or personalized gift, recognizing and honoring donors, we can create wall pieces that are designed to expand with time in a variety of different materials and options. We also create one of a kind or small runs of handmade custom trophies.